This no-bake Paleo and vegan cheesecake is topped with a thick creamy lemon layer with a simple nuts and date crust. Bite size cashew cheesecake is made quickly in a blender or food processor, then chilled before eating! Gluten free, dairy free, refined sugar free. In a food processor blend all ingredients for the crust until it reaches a coarse consistency- if you pinch it, it should stick together in your fingers. Grease a mini muffin tin with coconut oil and press 1/2 tablespoon crust into the bottom. Puree soaked cashews in a food processor for about 1 minute. Then slowly pour in the maple syrup first and then the rest of the ingredients. Blend until completely smooth and pour 1 tablespoon filling into each serving. Chill in the freezer for 4-12 hours until firm- more or less time depending on the desired consistency. 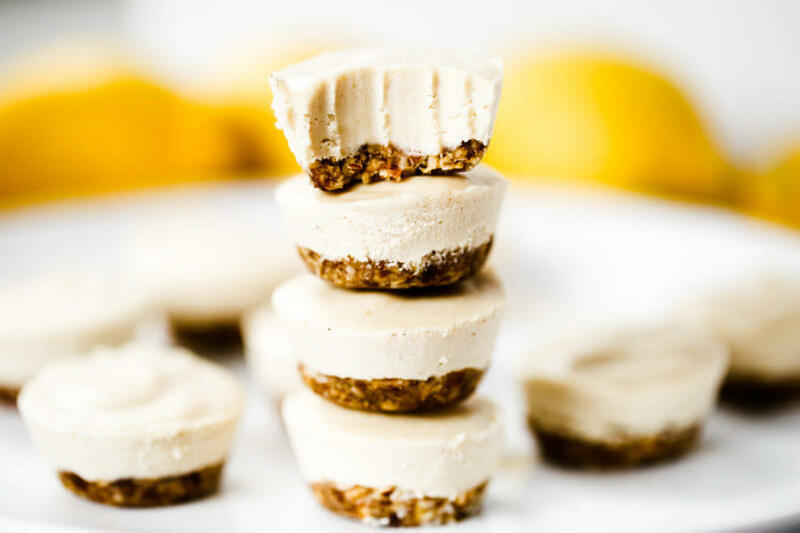 Nutrition Facts No Bake Lemon Cheesecake Bites Amount Per Serving Calories 168 Calories from Fat 117 % Daily Value* Total Fat 13g 20% Saturated Fat 5g 25% Polyunsaturated Fat 1g Monounsaturated Fat 3g Sodium 2mg 0% Potassium 23mg 1% Total Carbohydrates 12g 4% Dietary Fiber 2g 8% Sugars 7g Protein 4g 8% Vitamin A 0.01% Vitamin C 3% Calcium 3% Iron 6% * Percent Daily Values are based on a 2000 calorie diet. 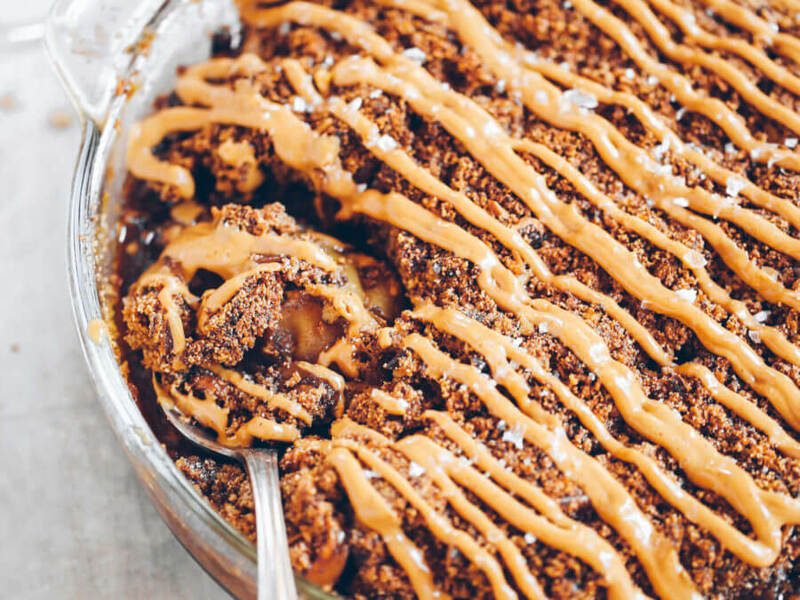 Amazing grain free apple crisp. 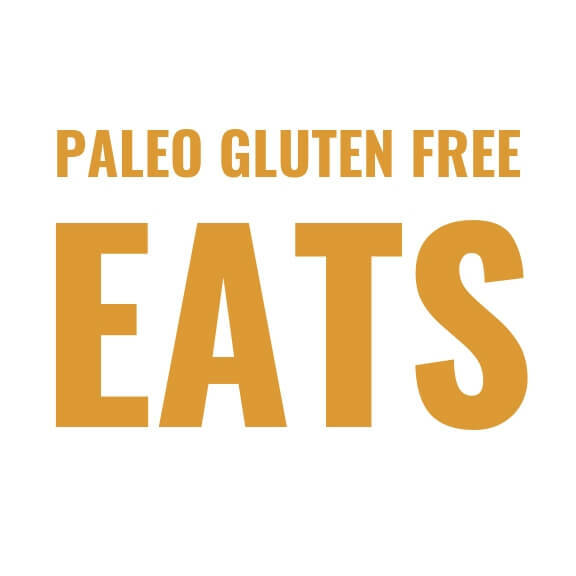 Paleo, healthy, gluten free, and naturally sweetened. Packed with sweet apples, warm and comforting, easy to make recipe for fall. In a large bowl add the apple slices. Toss together with the coconut sugar, coconut oil, arrowroot flour, pumpkin pie spice, and sea salt. Pour the apples into a 10" deep dish pie pan. Combine all ingredients for the crisp topping then crumble over the apples. Cover with foil and bake on 350F for 1 hour, then uncover and cook for another 20 minutes. Optional: drizzle with nut butter and serve with vanilla ice-cream or coconut yogurt! Nutrition Facts Grain Free Paleo Apple Pie Crisp Amount Per Serving Calories 627 Calories from Fat 441 % Daily Value* Total Fat 49g 75% Saturated Fat 20g 100% Polyunsaturated Fat 0.1g Monounsaturated Fat 1g Sodium 397mg 17% Potassium 76mg 2% Total Carbohydrates 48g 16% Dietary Fiber 9g 36% Sugars 32g Protein 9g 18% Vitamin A 0.5% Vitamin C 6% Calcium 9% Iron 15% * Percent Daily Values are based on a 2000 calorie diet. 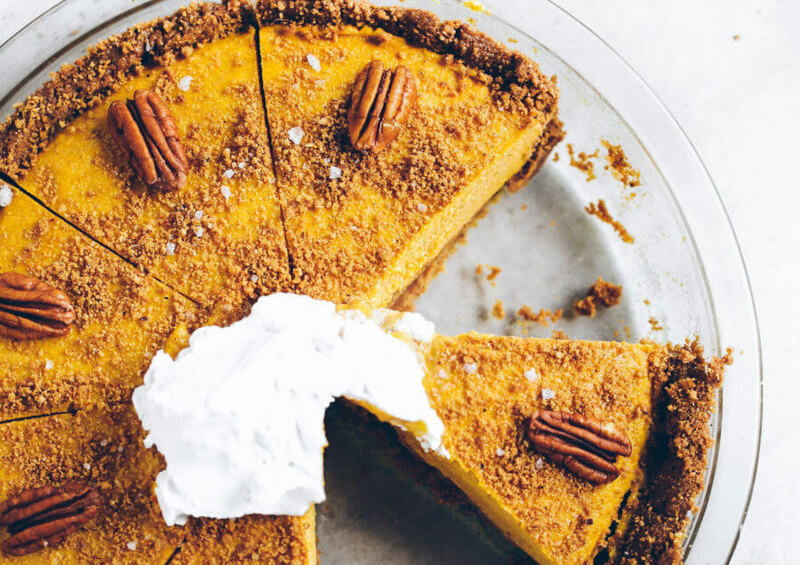 The easiest vegan pumpkin cheesecake! 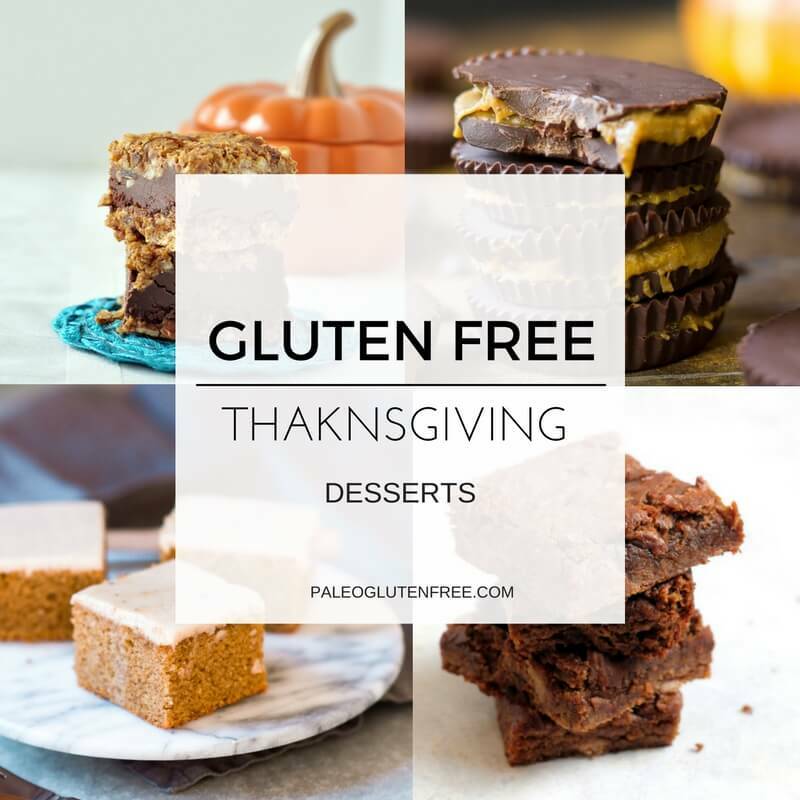 Grain free and paleo friendly. Pecan cookie crunch crust with a creamy vegan pumpkin filling. Lightly sweetened with maple syrup. 1 1/2 cup soaked raw cashews to make: soak cashew in hot water for 1-2 hours or in room temp water overnight, then drain. In a food processor blend the Simple Mills brand paleo toasted pecan crunchy cookies into a coarse ground texture. Add almond butter and palm shortening into the cookies and blend until combined. Then press the crust dough into a 10" pie pan and place in the freezer. For filling, blend soaked cashews in the food processor until they are minced into a fine texture. Add lemon juice and half the maple syrup and blend again for a few minutes until completely smooth. Add the rest of the ingredients for the filling and continue to blend for another minute or two. Pour the filling into the pie crust and chill in the freezer for 2 hours. Optional: Then top off with more cookies, whipped coconut cream, and pecans. Serve chilled and store in the freezer. Raw vanilla bean and cherry cheesecake made with paleo ingredients. Creamy cashew filling in a “graham cracker” crust. Stores well in the fridge and freezer. Naturally gluten free and dairy free. Preheat oven to 400F. Cut out a 10" circle of parchment paper and set it in the bottom of a 10" round spring form cake pan. Pulse together the almonds and pecans until minced. Then add dates and the rest of the ingredients for the crust. Blend together into a coarse texture. Press the crust into the bottom of the cake pan. Set aside for later (if you want a raw cheesecake) or cook on 400F for 20-25 minutes or until golden brown. Puree the soaked cashews in a food processor for a few minutes until they become a smooth texture. Then add in the rest of the ingredients for the filling and puree until completely smooth! Spread the filling over the crust. Then freeze for about 2 hours until firm. 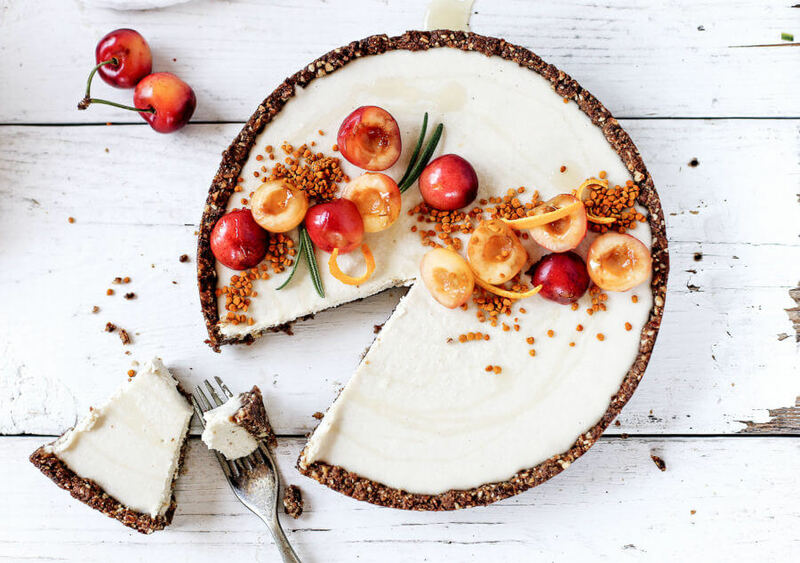 Once the cheesecake has firmed up, take it out of the freezer and top with fresh cut cherries and bee pollen. Nutrition Facts Raw Vanilla Bean Cherry Cheesecake Amount Per Serving Calories 307 Calories from Fat 180 % Daily Value* Total Fat 20g 31% Saturated Fat 6g 30% Polyunsaturated Fat 3g Monounsaturated Fat 9g Sodium 33mg 1% Potassium 88mg 3% Total Carbohydrates 28g 9% Dietary Fiber 3g 12% Sugars 18g Protein 6g 12% Vitamin A 0.01% Vitamin C 1% Calcium 3% Iron 11% * Percent Daily Values are based on a 2000 calorie diet. 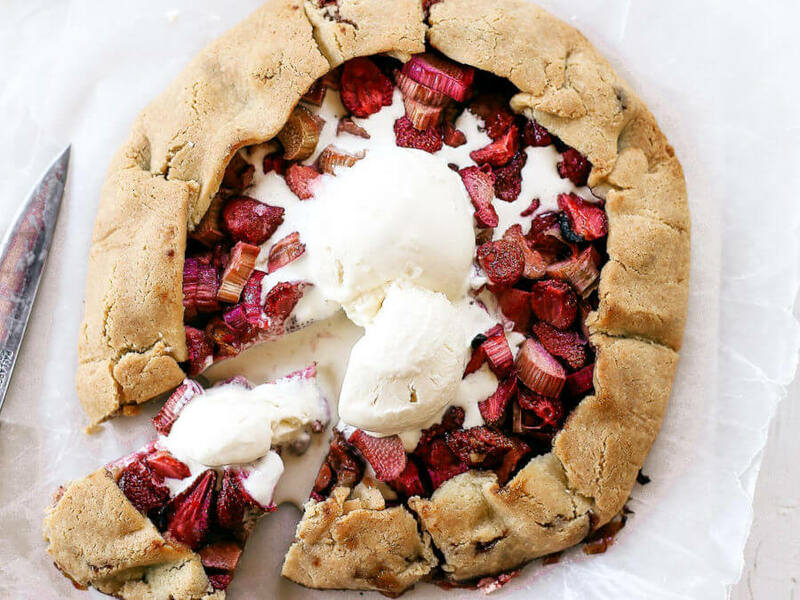 Incredibly easy grain free and paleo strawberry rhubarb galette. 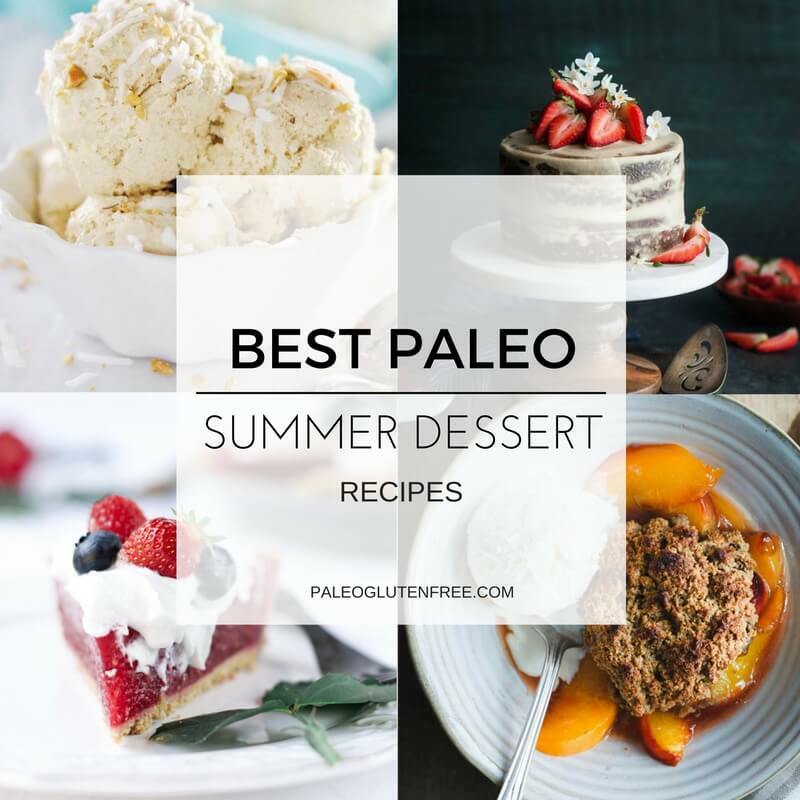 A healthy and simple summer treat made with whole food ingredients. Naturally gluten free and dairy free. Sweetened without refined sugar. In a food processor or by hand, combine all the ingredients for the crust until well combined. Then divide into two balls and roll out into a thin 1/5" crust. I suggest using extra arrowroot flour for coating the rolling pin and dough ball, so it doesn't stick. In a large mixing bowl add the ingredients for the filling and toss together. Divide the filling between the two crusts and fill the center of the crusts with filling, leave about two inches of crust on the edges (free of filling) to fold over. Gently fold over the excess crust around the filling to enclose the galette. Bake on a cookie sheet on 400F for 50 minutes until the crust is golden brown. Serve or top with ice-cream and then serve! Nutrition Facts Strawberry Rhubarb Paleo Galette Amount Per Serving Calories 365 Calories from Fat 234 % Daily Value* Total Fat 26g 40% Saturated Fat 3g 15% Polyunsaturated Fat 0.1g Monounsaturated Fat 0.2g Cholesterol 16mg 5% Sodium 66mg 3% Potassium 44mg 1% Total Carbohydrates 25g 8% Dietary Fiber 6g 24% Sugars 10g Protein 13g 26% Vitamin A 1% Vitamin C 42% Calcium 13% Iron 12% * Percent Daily Values are based on a 2000 calorie diet. Made in 10 minutes! 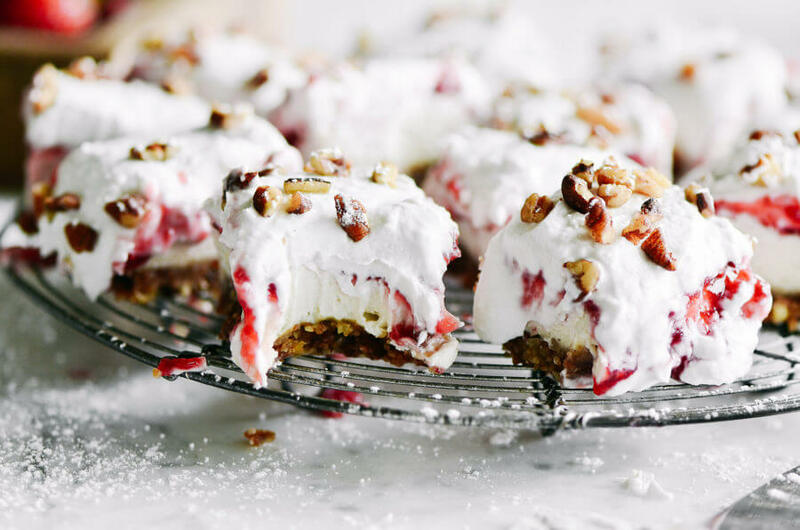 Heavenly dairy free, raw, and paleo cream cheese bars layered with a 2 ingredient crust, cashew cream cheese, raspberry filling, and whipped cream. Super easy to make in the blender and have 9g protein per square! 2 cups soaked cashews to make: soak in hot water for 1 hour until soft. 6 tablespoons raspberry jam you can also use strawberry jam or fresh fruit for a paleo option! Combine the ingredients for the cashew filling in the blender. Use the tamper tool to move the cashews around in the blender to ensure even and thorough combining. Blend until completely smooth. In a food processor combine the ingredients for the crust and pulse until the mixture breaks down and forms small granulars that stick together. Line a 8" by 4" pyrex pan with parchment paper. Then add the crust mixture, spread it out evenly in the pan, and then press down. Evenly spread the cashew filling over the crust and smooth down. Add the raspberry preserves or fresh fruit in over the cashew filling. To make the coconut whipped cream take a can of chilled full fat canned coconut milk (I use Thai Kitchen brand) and scrape the solid cream off the top. Put the coconut cream in a bowl with the vanilla and stevia then ship with an electric mixer until smooth. Top the bars off with whipped coconut cream, cashew pieces, and arrowroot powder for powdered sugar effect. Nutrition Facts Dairy Free Paleo Raspberry Cream Bars Amount Per Serving Calories 421 Calories from Fat 306 % Daily Value* Total Fat 34g 52% Saturated Fat 12g 60% Polyunsaturated Fat 5g Monounsaturated Fat 14g Sodium 12mg 1% Potassium 49mg 1% Total Carbohydrates 25g 8% Dietary Fiber 3g 12% Sugars 12g Protein 9g 18% Vitamin A 0.02% Vitamin C 4% Calcium 3% Iron 15% * Percent Daily Values are based on a 2000 calorie diet. 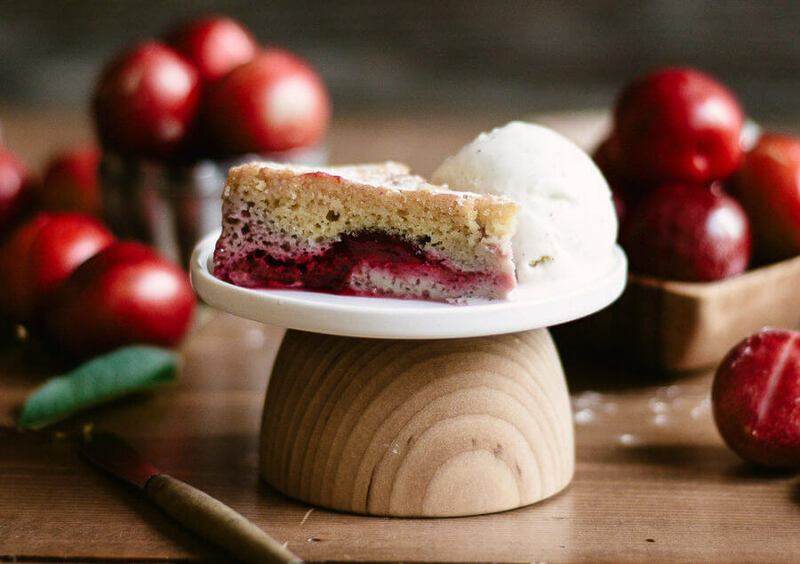 Print Recipe Paleo Plum Cake This..
Fun, pretty, and delicious! This gluten free and vegan pie is made with a delicious graham cracker crust. Filled with fresh raspberry filling, and topped with whipped coconut cream and berries. Add all ingredients (except gelatin) to a medium sauce pan and stir. Sprinkle gelatin on to the top of berries mixture. Let the berry mixture set for 30 minutes or until the gelatin is dissolved and starts to firm up. Transfer the sauce pan with the berries to the stove and boil over medium heat for 15 minutes stirring constantly. Let cook until the mixture is slightly thickened and the berries turn into a sauce. Pour the berry mixture into a bowl and chill in freezer for 2 hours. After the filling has chilled, pour it into the pie shell and chill up to an hour. 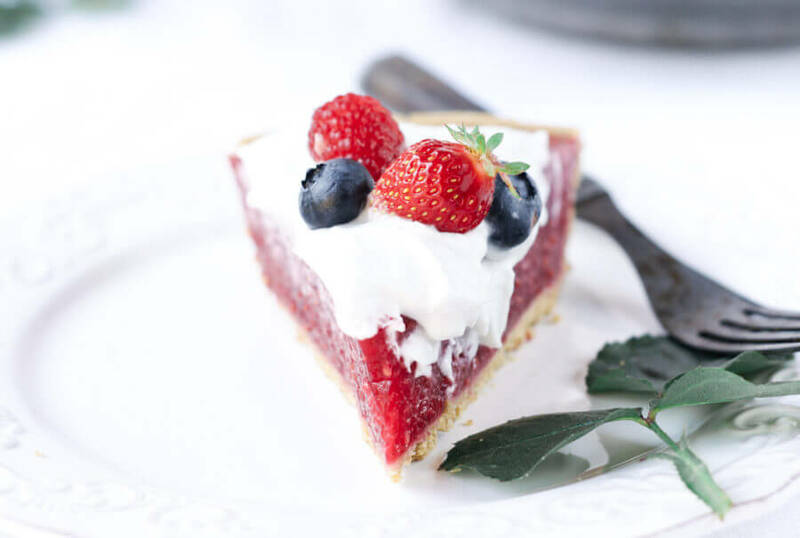 Nutrition Facts Gluten Free Raspberry Cream Pie Amount Per Serving Calories 167 Calories from Fat 99 % Daily Value* Total Fat 11g 17% Saturated Fat 7g 35% Polyunsaturated Fat 0.4g Monounsaturated Fat 3g Cholesterol 41mg 14% Sodium 27mg 1% Potassium 22mg 1% Total Carbohydrates 10g 3% Dietary Fiber 4g 16% Sugars 4g Protein 8g 16% Vitamin A 9% Vitamin C 31% Calcium 5% Iron 3% * Percent Daily Values are based on a 2000 calorie diet.